Manchester - South Africa were 12 for one in reply to England's first innings 362, a deficit of 350 runs, at lunch on the second day of the fourth Test at Old Trafford on Saturday. 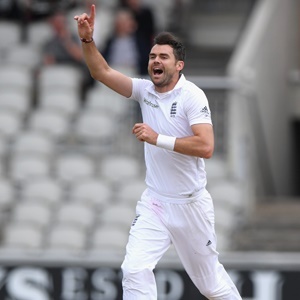 It took James Anderson just three balls to strike from the newly named James Anderson End at his Lancashire home ground when England's all-time leading Test wicket-taker had Dean Elgar lbw for a duck in the first over of South Africa's innings. Heino Kuhn was four not out and Hashim Amla six not out. Earlier, Jonny Bairstow made a dashing 99 after resuming on 33 not out in England's overnight total of 260 for six. Dropped on 53 by opposing wicket-keeper Quinton de Kock, when he only had last man Anderson for company, Bairstow faced 145 balls with 14 fours and a six. But having come through a tight review for a slip catch on 33 on Friday, the Yorkshireman fell one run short of what would have been his fourth Test century when he missed a sweep and was lbw to left-arm spinner Keshav Maharaj. England lead this four-match series 2-1.